Game shows go back as far as television itself, with rudimentary format quiz shows on radio paving an early path to shouting out answers even before those wonderful, ubiquitous little boxes first graced our living rooms. Granted, those answers you’re shouting out are most likely of the “think you’re right with 150% certainty, but that know it all family of yours beats you out every time” variety. It makes sense therefore, that as our entertainment has advanced over the past six-plus decades, that game shows would become increasingly more reliant on flashy sets, crazy rules and overworked technical features. In this space, I hope to explore how a variety of different game shows from the past interacted with society around them, and on what level this interaction actually affected the show itself. We will visit the classics over the next coming months (as well as a few lesser known programs) to explore some popular shows that would have trouble surviving in today’s TV landscape, some that have been brought back from lengthy retirements only to quickly fail, and some that have managed to stand the test of time despite eschewing any major overhauls to a tried and true format. 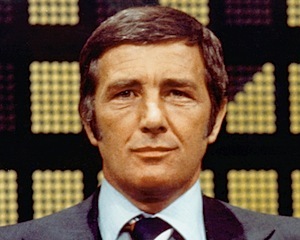 This month we take a look at Family Feud, brought to life by Mark Goodson behind the metaphorical curtain and (the dearly departed) Richard Dawson as an always-game host. (Quick side note, if you would like to know who else to thank for most of your game show enjoyment over the years besides Merv Griffin, feel free to peruse Mark Goodson’s stunner of a Wikipedia page.) Throughout the variably successful years after Dawson, Family Feud has been helmed by Ray Combs, Louie Anderson, Richard Karn, John O’Hurley and Steve Harvey. 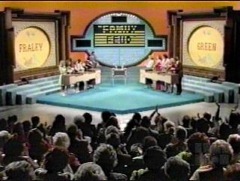 Originally premiering in a daytime slot Family Feud debuted on June 12, 1976 as a test run in the same strategy many networks use today for new programming throughout the summer. Shortly after premiering to positive numbers it was moved to the primetime schedule, where successful ratings and Emmys followed. Now in its 32nd non-consecutive season Family Feud still embraces the format that made it so popular during our nation’s bicentennial year, give or take a few politically incorrect answers. For anyone who is not immediately familiar with the format of Family Feud, it isn’t a concept that takes too long to wrap your head around. Two (usually non-nuclear) families made up of five people face off by trying to give the top answers to a question, with the rankings based off of a survey of one hundred people taken by the show beforehand. (For those curious, during the first few decades of Family Feud’s existence, this survey was simply made up of 100 members of the studio audience who were asked various questions. Now, anyone can contribute to the “survey” by logging on to the show’s official website.) If three correct answers are given, that’s three strikes and the opportunity is given to the other family to “steal” the points from that round. The first two rounds are played for normal points, with each following round played for double and triple points before resorting to a sudden death round. The first team to reach 200 points (in 1976; since increased to 300 points) advances to the final round and chooses two out of the five contestants to compete for the opportunity to win $5,000 (also since increased to the present mark of $20,000). There are no special trips to Jamaica involved or extra jackpots to pick up on the way to the final round. Your family wins the final round and you get money; about as black and white as stakes can be. Because the rules themselves are so inherently simple, it allows what makes up the rest of the show to shine through in ways that game shows today simply can’t (or won’t) do. When the contestants are asked for answers no flashing or dimming of the studio lights or menacing music accompanies their contemplation. The only thing supplementing the existing tension is a single tone that lets them know they have three seconds to come up with something, ANYTHING, or suffer the consequences of a strike against their family. This serves two purposes. One is that it lets the at home viewer more fully experience the environment the producers have worked so hard to craft by allowing them to focus only on the contestant trying to think of an answer instead of the audience reacting on cue or cutting to commercial in order to heighten the suspense. The other is that it gives more of a sense that anything we are seeing is what actually happened while filming, instead of the heavy post-editing room sheen that is overtly obvious in game shows created during the ‘90’s on. It isn’t immediately clear whether this is an illusion created by the yesteryear allure of watching these episodes more than 30 years after they aired, or if the editors were just that good as to hide any manufactured moments they may have created. Modern day game shows are forced to add crazy rule changes, higher stakes or more insane sets, otherwise they are less likely to keep people entertained throughout the standard 30 minutes to an hour duration and entertain the risk of losing ADD afflicted viewers to one of the other 400 channels offered. 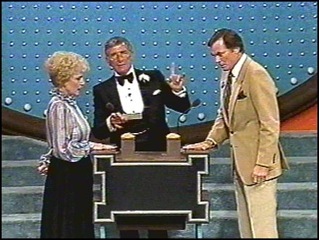 Touching on the “lack of an insane set” side of things, the set that Family Feud premiered with (and continued to use for years after) is borderline absurd in its nostalgia. It’s almost as if the producers decided that they didn’t want what the 1970s were offering, but had a real thing for the 1870s instead. Carpeted stairs make a fairly prominent appearance, because why not!? The wood paneling is probably to be expected given the year, but not in the quantity that it appears here. Do mustard seed yellow and washed out blue make you nauseous? Then I recommend you pair any viewings of vintage Feud with some Dramamine and a strong will, because it seems like everywhere you turn are variations of the same iffy paint samples. Even with this gem of a set-up the best part of the presentation isn’t even any part of the static set, but how the contestants themselves are introduced. It may be the biggest indication both that what you are watching does indeed have a quirky side and that when the show did decide to embrace some more creative and technology based ideas, they were fairly limited concepts. Instead of calling the families out from backstage at the beginning of the show or having them already in place off camera, they start out placed behind a screen that can only be described as a giant needlepoint ring with their surname stitched into it. Yet another example of the ambiance being inspired in large part by a Little House on the Prairie marathon. As the family is announced to the audience the screen is drawn back to present the five members, which is where this gets either really creepy or really entertaining depending on your state of mind when watching. Instead of having them facing out toward the cameras or smiling in the general direction of the studio audience, the contestants are placed in a faux-‘70’s living room, frozen in poses facing each other in what can only be described as the creepiest presentation of a family spending quality time together since the original Stepford Wives was released. (Actual thing I wrote in my notes: “The first image of people frozen in place that disturbs me more than House of Wax”). Not once at the beginning of an episode was I able to contain my laughter when they introduced the families, not a single time (and in the interest of saving everyone some time I won’t even start on the clothing…I could write another whole feature on the entertainment those brought). Amidst all of these pieces that are so easy to make fun of is a big part of the show that not only ties everything together here, but in this instance also manages to outshine every other aspect. I am talking about the man of the hour of course, Mr. Richard Dawson. It takes a lot to come out of the starting gate strong as a game show host (looking at you Bob Saget) and watching Dawson in a handful of the first episodes there is little hyperbole present when I say that he did it at an level equal or better than anyone else I’ve seen. From the top of the show all the way to the last question Dawson not only maintains the necessary high level of energy but also makes every contestant feel like they are the most important person in the room. Nicknamed “The Kissing Bandit” due to his habit of giving a peck on the cheek to contestants (which he later confessed his mother did to him throughout his childhood and he felt the need to pass on), you can tell when watching that he was always happy to be a part of the show and truly wanted to make the audience feel just as excited to watch as he was to be there. Dawson was able to flirt innocently with the younger members of each family, propose marriage to the older (and already married) ladies, and poke fun at everyone else while he was at it. Of course it didn’t hurt that he was as dapper as can be and always dressed to the nines. Even while he was effortlessly turning out laugh after laugh he never forgot to enjoy himself just as much. In one memorable entrance he brought his actual passport with him to show off his newly official American citizenship but he could suffer a solid “Colbert reporting on Prince Charles” level break as well. When you tune out all the other moving pieces of the show and watch only Dawson doing what he did best it becomes increasingly clear that he never forgot to enjoy his job and knew how lucky he was to be doing this type of work. As was glaringly obvious in both his work here and in later years in his work on Match Game, Richard Dawson was not in that studio for a paycheck. This is probably one of the most overlooked (or just one of the most ignored) reasons that current game shows burn out faster than a Teen Mom spin-off. Audiences can only be entertained by the central concept for so long until some believable energy and enthusiasm from the host is needed to maintain any desire a viewer may have to watch. Not everyone is guilty of this (see Philbin, Regis) but most B-list celebrity hosts that are wrangled into the job aren’t exactly itching to be there. Something tells me Jeff Foxworthy didn’t get into stand-up comedy so he could eventually share a stage with contestants less intelligent than the 5th graders with which they appear. And I highly doubt Guy Fieri viewed “Minute to Win It” as a bridge to career relevance rather than just a weekly money grab (unless it was his agent or manager who saw it that way, in which case fire that person stat and find a better bridge yourself, Guy). Richard Dawson either really didn’t care what he was being paid or never let the fact that he did show. In the end, it’s a testament to his skill at helming Family Feud that the audience never had a spare moment to figure it out either way. So how has Family Feud held up over the years? There have been few occurrences of time off the air, experiencing breaks in ’86 and ’96, but it has also transitioned through an assortment of styles and rule changes before reverting back to essentially where the show began. The tally of hosts has now reached the half dozen mark with each bringing their own unique, if not always actually successful, style to the stage. When you think about it, these variations and missteps probably helped Family Feud stay on the air for this long at all. Not everything can be a daytime and syndication juggernaut with unflagging popularity while also remaining exactly the same for multiple decades (Dear soaps; you fall squarely in this category). Besides the requisite updates to the set, the Steve Harvey Family Feud has embraced the same rules as the original wholeheartedly, and there is a reason this is so. In an age where constant exploration and return to past fads by younger generations is the norm, part of the allure of going back to watch shows from decades ago is that it brings a certain nostalgia and understanding of what exactly previous generations watched as a family during either the pre- and post-dinner lull. But it also presents a unique opportunity to remember what the standard was all those years ago for some quality, non-judgmental entertainment. Whitney McIntosh resides in Massachusetts and is an undergraduate student at the University of Connecticut. You can follow her on twitter at @whitneym02. I love Family Feud but I think it is disrespectful to the contestants that Steve Harvey does not introduce the families. I believe all the other hosts do the introductions before they begin the game.